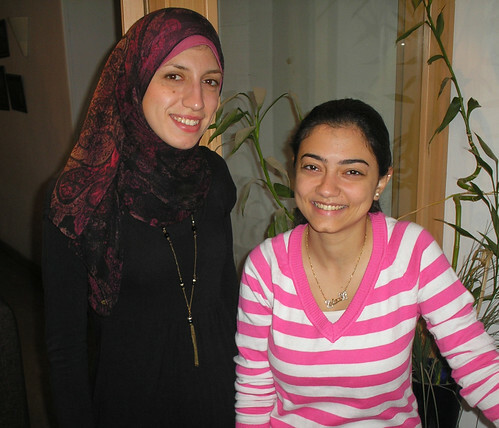 We are starting our fifth week of work here in Cairo. 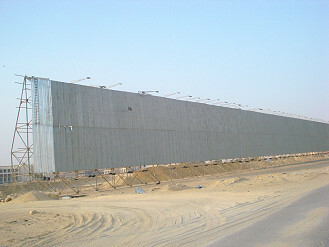 Construction proceeds in SL. We are rapidly running out of prims. The design is starting to be dictated by what looks best with the fewest prims – not an ideal situation. We anticipate a major presentation to our client About el-Enein tomorrow. I’ve been considering using only a walk-through of the SL model and not showing any drawings at all, though it may be necessary to have a plan for orientation. His staff has had a walk-through and seems very impressed and is talking about buying two sims in order to build the entire project. 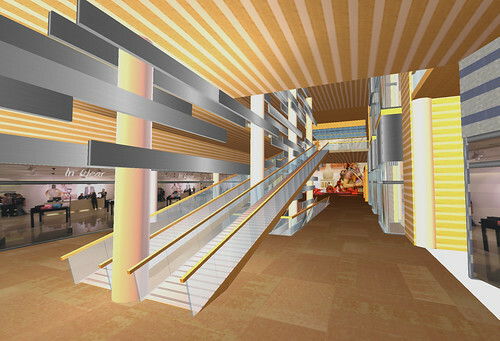 So far we have only built the interior public spaces of the shopping center for about half of the project. Thus the build viewed from the exterior looks completely chaotic. One has to walk through the interior spaces to understand it and unfortunately many of our visitors cam through the entire site and do not experience the sequence of designed spaces. The final build-out on two sims would include the exterior and the hotel and office building. Of course, we will have to come to terms on fee to construct this, not so easy. We also are interested in exploring with Keystone Bouchard the possibility of open sims and Vray. There seem to be many advantages to this, but we will have to rebuild it in 3d max. We are going to do a test run with him in the next few days. Meanwhile, Judith and I were guests of Zeinab’s (co-captain of the Egyptian SL building team) family at their beach house on the Red Sea, where there was no internet connection. It was good to get away from the frenzy of Cairo and to take a break from the computer. Even though, we found ourselves missing it just for 24 hours. We watched the Lebanese version of “American Idol” instead. This trip gave us the opportunity to visit our client’s manufacturing facility, Cleopatra Ceramica. We spent some time there looking at tiles they produce that could be used on the exterior of the building. Including the tiles is a primary concept of our design. The problem with this is that even though some of these tiles are as large as 30 cm By 40 cm, they are not made for large-scale application. We are talking with the client about designing a series of tiles specifically for exterior architectural application. Should be lots of fun. We were astounded at the size of his factory and the capability of ceramic technology to convincingly replicate almost any material. They produce many interesting things we do not see in the United States. My favorite is the new sports-themed bathroom fixtures, in particular the toilet shaped like a soccer ball. As you will see in the attached photographs, we finally succumbed to the temptation of including a bit of the pharaonic style. 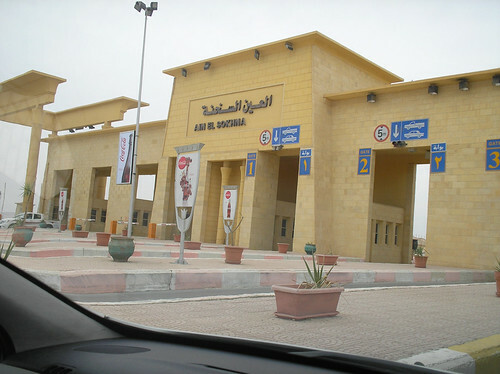 It seems like every new building in Cairo (see photo of pharaonic toll booth) is in this style. And of course none of them do justice to the originals. We decided early on not to insult the great builders with our own interpretation but it was just too much to resist, so we have our own little hypostyle hall à la Temple at Karnak. I guess it would be a bit like an Egyptian architect coming to Virginia and designing Williamsburg style houses. Oh well, it was fun doing it. 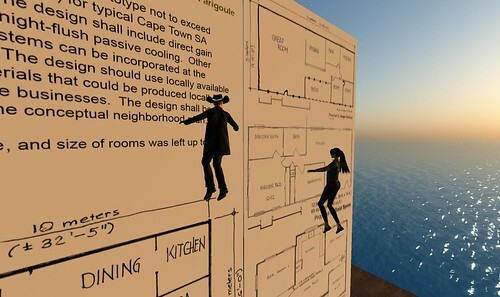 At this point, we can clearly say that building in Second Life ® has been invaluable as a design tool. We will know better after tomorrow how useful it is for the client. Our work here concludes in about another week, which is okay as it’s getting hot and we’ve been having sandstorms. Those sandstorms make me realize that one cannot have any sloped surfaces on the building that are visible, because it collects this sand, which is mixed with air pollution and leaves a dirty grime on any upward-facing surface. We are concerned about the fabric structures. We got excited about the possibility of adding decorative patterns, which is a tradition here in tent structures, even today. Just as we were about to present this to the client, someone pointed out to us that these are for funerals. Oops! Another cultural misstep. We had dinner last night with Alexander Johnson, a former newcaster with ABC and now a consultant. He is here working with our mutual client setting up a television network. Both he and our client have expressed an interest in exploring the possibilities of interface between TV programming and the virtual world. Everyone is excited here that Obama has announced he is coming to Egypt. 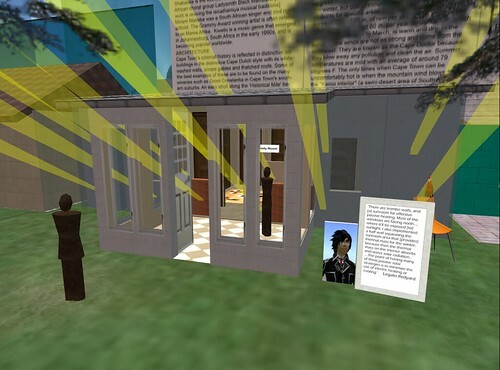 It was the very first time for me to hear about Second Life, when I was told by Architect David Denton – whom I was assigned to assist on a really big project – that I had to learn SL, understand it and actually build this whole project on there. Of course I felt really worried that I wouldn’t be able to get the hang of it, until I began reading a certain “How to” book about SL and tried out everything while reading. And to my surprise, SL wasn’t at all what I expected, it was actually very easy to build things and modify them, and in almost three hours I was building away. Amazing! That’s what I kept thinking while I was building this project, how you could do almost any object, and how you could actually walk through your project instead of just trying to imagine how a certain part on the plan looks like. Of course I have worked with other 3D design programs, but it was never this easy or this quick to build and adjust a model. I just loved it, and felt really excited whenever we had a new part built with all its details. Such a big project was virtually built in such a short time, and is looking that promising, just can’t wait to walk through it again, but in real life next time. Here is a brief video showing some of the amazing work currently under development at the University of Auckland’s Putahi sim (SLurl) in Second Life, led by Professor Judy Cockeram. The University continues to leverage their virtual ‘Living Sketchbooks’ (covered previously HERE), but this time there are over 115 first year students exploring the virtual space, and it continues to evolve each day. After visiting the site several times since construction started, I can confidently say that it does, in fact, feel as though the place is alive. 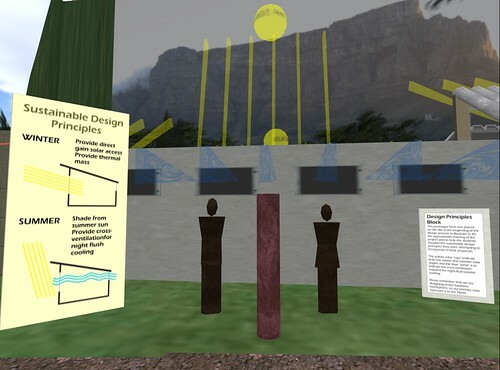 Instead of pinning up sketches on a wall, students are exploring design concepts in an immersive virtual environment, where they work amidst the growing virtual community that has grown to hundreds of thousands of users strong, along with a rapidly growing number of architecture schools that are actively exploring virtual worlds in education. I asked Judy to describe the current project. “They are currently in their first semester doing an Architecture media course, ARCHDRC102 which includes paper based drawing/collage etc for the first 6 weeks then in the second six weeks we are considering technology –the aim is to get them working in a creative way – they come with strong drawing and modeling skills that enable them to design in an unimpeded way and we are using Second Life to put the focus on design rather than the interface of a ‘big’ cad package,” Judy explains. The work currently seen on the sim is only development work, and the actual assignment is yet to come. This is building on the work that 8 other students in the University’s “ARCHDES300 Design” course, which happens during the first semester of the third year of the Bachelor Degree. Stay tuned for more information and an invite to their final presentations! 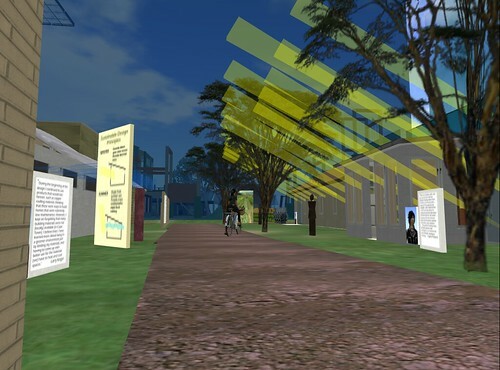 The Delaware Technical & Community College has made a strong and successful debut in their use of virtual worlds in architectural education through a project led by Professor L.C. 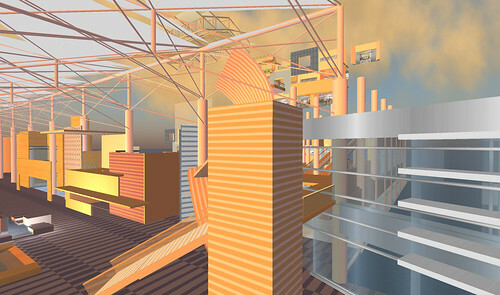 Weaverling’s (Profesora Farigoule in SL) ‘Architectural Design: Foundation Studies I’ class. I met L.C. while touring another architectural student project led by Judy Cockeram from the University of Auckland (more on their work coming soon! 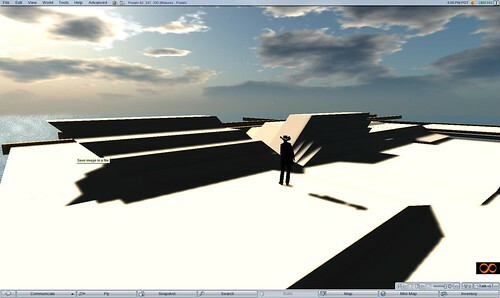 ), who is also exploring the use of virtual worlds in architectural education. After renting some land on Architecture Islands, their parcel rapidly transformed from an empty grass field to an array of design ideas by students which quickly evolved over several weeks into the final presentation it is today. 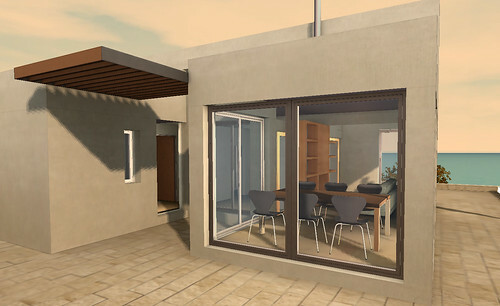 The students collaborated with a Second Life community called ‘Uthango,’ (creators of the Virtual Africa project) to investigate proposals for sustainable design housing prototypes for use in the redevelopment effort in Cape Town, South Africa to replace existing marginal housing in the township areas. The students were not only able to explore and share their design ideas in an immersive medium, but were also able to interact with a real ‘client’ at Uthango, who could provide feedback throughout the project. As such, the students learned a lot about the culture of South Africa, and had to adapt their designs throughout the semester to better accommodate local conditions. 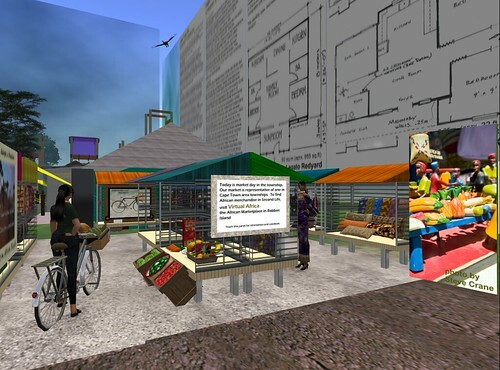 The students also visited the ‘Virtual Africa’ project in Second Life to learn more about the culture. When asked if there were any other challenges, L.C. mentioned several issues with having computer access. 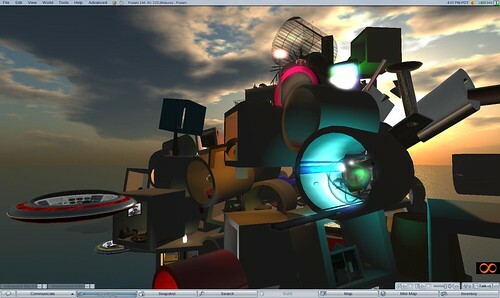 In one case, a student’s spouse would not allow them to use Second Life on their home computer, since it was perceived as being just a video game. We talked about academic perception of virtual worlds for architectural education, and how it compares with professional adoption within architecture firms. You can learn more about the student’s projects on their class blog HERE. 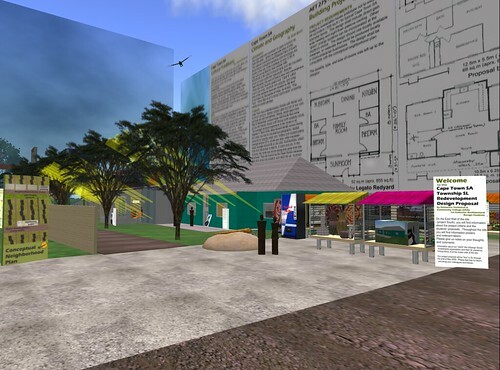 “On behalf of our first year Design Fundamentals studio students, I would like to invite you to visit their final design project in Second Life, which is a Cape Town SA township redevelopment housing proposal. 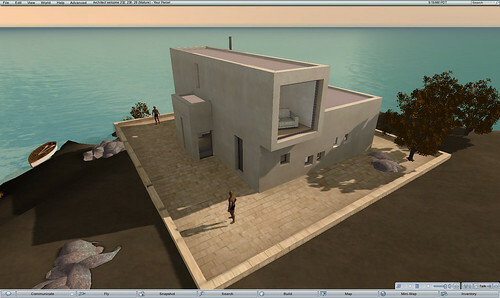 Our site will be open from May 13 – May 29 , 2009 on Architecture Island. We have set up notecard takers for each project and various places on the site, in order to enable our visitors to be our virtual jury. I will be on site on Thursday, May 14 from 4am-12pm and 4pm-7pm SLT (corrected times). The students will be dropping in to visit on Thursday, May 14 as well. If you would like to schedule a guided tour at any other time, please IM me, and I will be glad to meet you at a time convenient to us both. The students conducted a project research phase prior to beginning their design in which they studied South African history, culture, geography, climate, and built environment. They were then tasked with developing a proposal for redevelopment of the informal settlements surrounding Cape Town that are a legacy of the former apartheid era. The South African Housing Development Agency has a goal of transforming or eradicating all informal settlements by 2014, and is striving to deliver over 250,000 housing units per year. 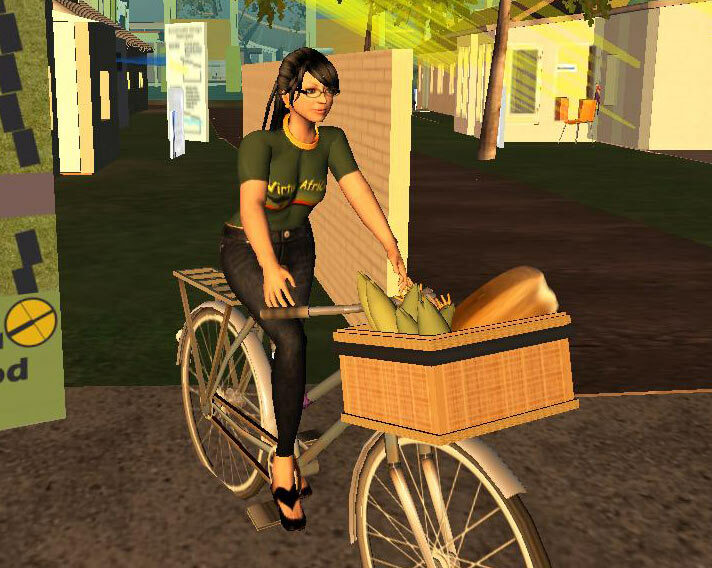 Through Second Life, we were able to collaborate with Uthango Social Investments, a Cape Town non-profit NGO that is working in real-life on this and other poverty reduction micro-enterprise projects. The students collaborated on developing an overall neighborhood plan, and then each student individually designed a housing prototype to fit within this plan. The criteria for the design were few and straightforward: Design a house for a typical Cape Town township family not to exceed 90 sq. meters and utilize sustainable design principles in heating, cooling, and material selection. We are looking forward to your visit, and especially to your comments. The students will return at the end of May and collect their individual comments, and I will summarize all other commentary for them. If you are using virtual worlds in architectural education, or are thinking about doing so, please consider attending a session on Architecture Island next Friday the 22nd, called “The Learning Curve for Architectural Education in Virtual Worlds.” More information can be found HERE. We have a list of confirmed participants is all but guarantees the session to be worthwhile, informative, and hopefully inspirational. In the larger sense, I don’t know why we are here. Two years ago, my name appeared on a short list of international architects approved by the Egyptian government for planning projects here. My first reaction was suspicion, especially when I received the same week an invitation to come work in Nigeria, which quickly proved to be a scam. It seemed particularly curious that my name would be on a list of seventeen firms, most of which were huge international enterprises. I was amused to learn when first arriving in Cairo that my client’s assumption was that my firm was of comparable size. What a shock when he found out I had only one employee! I may never know why I was chosen; even the Egyptian government could not explain why I was on the list. Two Cairo firms, Hamza Associates and PUD Consultants, were asked by the Egyptian government to submit proposals and contacted me. 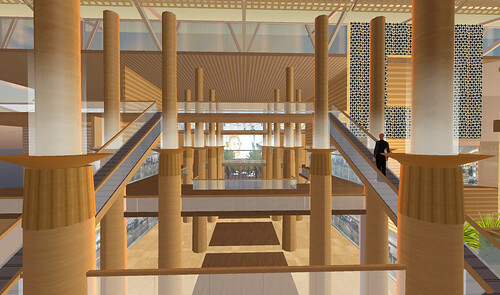 Hamza Associates is a storied firm known for its work on the Alexandria Library. PUD Consultants is smaller and younger. Its owner, Amr Attia, had recently received an Eisenhower Fellowship to study planning in the United States and covered 25 cities in two months. I showed him around Los Angeles when he visited there. By now I have worked on two projects with Hamza Associates. 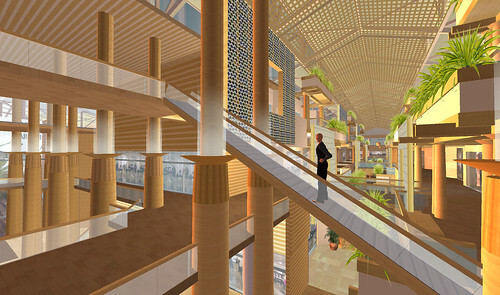 But my current client, Mohamed Abou el Enein, president of Cleopatra Ceramica, preferred my recommendation of Amr Attia and PUD Consultants for the executive architect position on this latest project: a shopping center, hotel, theater, and office park complex in the new Cairo suburb Sixth of October City. So here I am again, living as Enein’s guest in a suite at the Four Seasons Nile Plaza Hotel, going off to work in Amr’s office in Zamalek. My wife Judith is with me. I meet regularly with Abou el Enein, usually at his villa on the Nile, amid Italian marble splendor, sipping Turkish coffee, frequently late at night, as Egyptians never seem to sleep. Enein, who has built a ceramics empire selling products all over the world, flies his own Gulfstream jet, works two cell phones at the same time, one for each ear, never seems to lack for energy, and loves the idea of pioneering in the virtual world. The staff at PUD Consultants are working with me to build the first phase of the project on Second Life®. I have been working in Second Life for about two years, and have done projects for McKinsey & Company and Stanford University Library, among others. These SL projects were produced while maintaining an RL practice in architecture and planning. My goal for some time has been to integrate these two worlds and to utilize SL for designing an RL project. It took some time to work up the nerve to actually try it and to find a client willing to go along for the ride. In addition, I was waiting for a project or design challenge that truly justified using SL as opposed to other 3d modeling programs, such as 3d max, which I normally use. I also found that I was falling back into old, bad habits working with 3d max. I tend to determine the key views for the final rendering early in the 3d modeling process and then design the project for those several key views. The rest suffers from lack of attention. 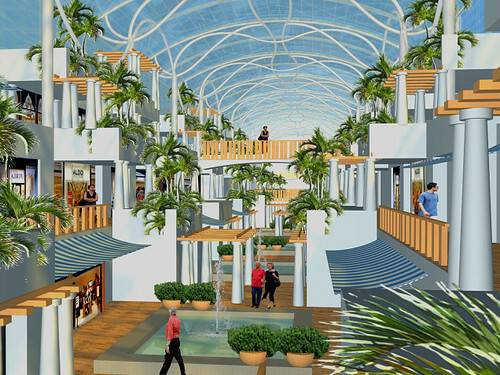 The first phase of the Cairo project is the shopping mall. Shopping malls in the United States are changing rapidly, away from the “mall look” and more toward recreations of traditional shopping streets. Even though Egypt is somewhat behind the United States in terms of shopping trends, I did not wish to be building a dinosaur that would quickly be out of fashion. 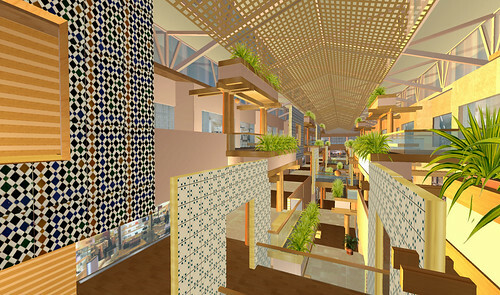 So I designed an interior shopping arcade space meant to be reminiscent of a Mediterranean village, inspired by quaint shopping districts in such places as Capri and Positano. 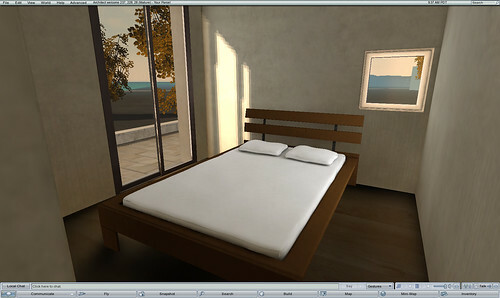 Initially I built the space in 3d max and produced several renderings that I showed to the client. The client seemed to have difficulty understanding the space, as I had to admit, I myself was experiencing too. The project seemed imperiled; so I decided, now is the time to try SL as a design tool. It worked. The client was happy and we were on our way back to Cairo. This project needed to be experienced dynamically by moving through the space. Fortunately, the client had recently heard about the possibilities in the virtual world and had been told he could put his products (ceramics such as bathroom fixtures and tiles) into a virtual world catalog. This discussion led to an agreement to try SL as a design tool for the project. I was surprised how quickly the first pass build actually went, as compared to working with 3d max. As a design tool, SL has proven to be invaluable. Constantly moving through the space, examining it from various angles, has improved the overall design quality. There are of course drawbacks, such as no shadows, difficulty working with curved forms, accurate measurements, availability of SL in Egypt, etc. One of the difficulties in working with SL is my tendency to design the project for what can be built given the limitations of SL tools. Thus the final judgment of how useful this is remains to be seen. Perhaps the ultimate test is not just how useful it is for the architect as a design tool, but will it have a life beyond? The dream is for the client to use the final build for promoting the project and leasing tenant space. His company, Cleopatra Ceramica, could use the larger spaces to exhibit their products, a virtual website. The company advertises extensively throughout the Middle East and could incorporate a reference to the virtual site in their advertising. But all of this is in the future. Right now, we are simply using it as a design tool. As such, we are constantly making changes, leaving behind more of a 3d sketch than a presentable product. If it does have a life beyond the design process, it will probably have to be rebuilt – a major concern. The project is over 400 meters long. 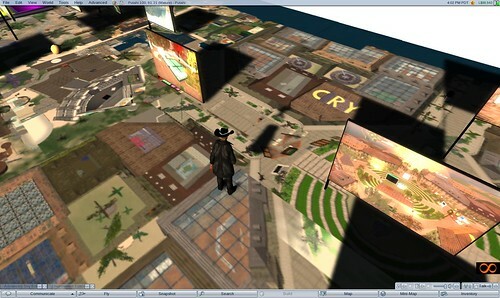 We are building only half of it in Second Life, as it is more or less symmetrical. But the other half will have to be built eventually. Because of the size, the land costs in SL are a consideration. Not cheap, but not a major cost if it proves to be an effective marketing tool. No one knows at this point. I will continue to submit dispatches as we move along, telling you more about what we have learned about the pros and cons of working with SL as a design tool. At the moment, I can’t say for sure where it’s headed. Attached are some photographs of our progress. Also included is a photograph of the site, which is mostly sand, on which the owner has erected, in true pharaonic style, a giant billboard approximately 60 feet tall and 400 feet long, awaiting renderings of the proposed project. The resolution of SL renderings on a laptop screen is one thing, but blown up to that scale is quite another. 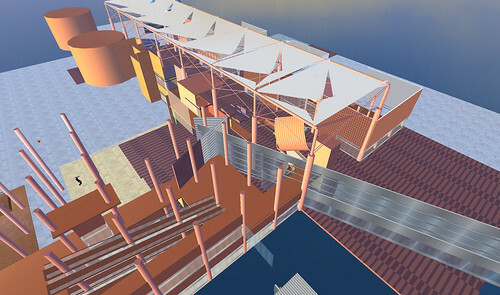 It remains to be seen whether this will have to be rebuilt in 3d max in order to produce sufficient quality renderings. We’re all a bit nervous about how that is going to turn out. Nothing in this part of the world seems to be on a small scale. In the spirit of the great Egyptian builders, the front façade of this project will be a gigantic electronic sign, sitting in the middle of a lake, with its reflection visible from the main entry. The name of the project is, in fact, “Reflections.” One will drive into the lake, into the reflection of the sign, to enter the parking garage. SL provides the opportunity to see this representation with an actual moving video on the electronic sign and the sound of splashing fountains, allowing the viewer to have a more complete experience than a 3d rendering could ever portray. I hope to be far enough along by next week to make a design presentation to the client that will comprise a walk through with avatars and no drawings, not even plans. Working in the office of PUD Consultants with Amr Attia and a team of young Egyptian architects has been a fantastic experience in so many ways. The practice of architecture in Egypt is quite different and yet SL seems to diminish those differences. There’s something very bizarre about leaving Los Angeles for faraway Egypt, saying goodbye to my SL friends, and then never really leaving them because we are together in SL. Initially I resisted a long stay (as requested by the client in Cairo), which this trip is now turning out to be, because I believed that producing the design in the virtual world was viable and loyal to the ideal. Actually designing the project in Cairo has convinced me that physical presence in the local culture is invaluable. Judith and I have been spending what little time I have had off from work exploring Cairo, particularly the historic Islamic districts, studying ancient marketplaces such as the Caravanserai and incorporating some of the ancient and traditional materials and patterns. One day last week was spent in the Khan el Khalili bazaar with narrow, crowded streets and visual cacophony of products, stacked and hanging everywhere. The end of the day was spent at City Stars, a contemporary indoor shopping mall typical in the United States, where this model is now considered obsolete. One conclusion that I have reached is that the narrow shopping streets with the visual stimulation of product displays make for a much more interesting experience. Thus I reduced the widths of the walking areas from the traditional shopping mall to intensify that experience. 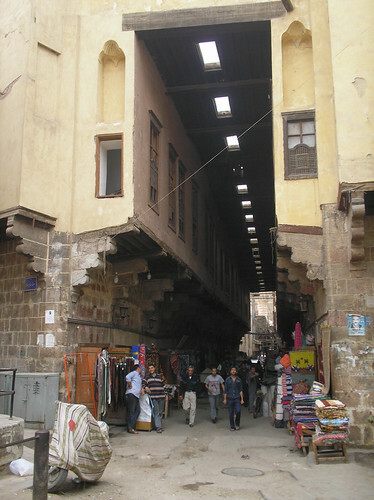 Many other elements of traditional souks have been incorporated, such as dappled light patterns from overhead trellis canopies, extensive use of wood and storefronts as open as possible. Tiles from the owner’s company, Cleopatra Ceramica, will be used extensively throughout the project, which will in effect become a showroom for their products. The architectural interest and variety will be achieved more through the use of these tiles in unique patterns rather than extensive architectural ornamentation. I will also be designing new architectural tiles for the company. Everyone is welcome to come visit and meet us in Second Life, DB Bailey and the Egyptian crew. We would also very much like to hear about any experiences you have had designing RL projects in SL, and advice you may have for us. Questions to be answered in future dispatches: Will this project keep going, contrary to most other development projects of this size around the world in this economy? Will the client in the end find SL as a vehicle to be useful and cost-effective? Will we in the end find it cost-effective as a design tool? Will we get back to Los Angeles before the searing heat of the Sahara? Will it be convincing as a presentation tool for the client to promote the project? Will the client get his own avatar and spend time himself exploring the design? Will our dog still remember us? Will we ever tire of hearing how much the Egyptians love Obama? Check out this Vray rendered model uploaded on the ArchVirtual grid by Jules Vos. The rendering quality, combined with the dynamic shade and shadow create a visually stunning and comparably low-cost way to experience an architectural design. We added finishing touches and entourage directly from SketchUp – via Google 3D Warehouse (row boat, landscaping elements – really anything you can imagine). See more screenshots HERE.